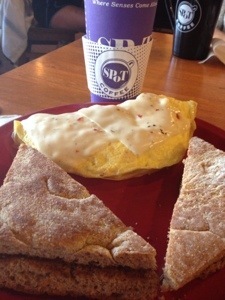 This Omelet Was “Spot” On! I met my friend Amy at Spot Coffee on Elmwood Avenue in Buffalo NY yesterday. We actually schedule “coffee talk” where we support each other, listen to each other and coach each other. She is a journalist, triathlete and blogger. You can follow her blog, Byline To The Finish Line here. She writes about her training experiences, challenges and triumphs. Today she is running her first ever bike trail wine tasting. How cool is that? What started as a “lets have coffee and pick each other’s brain” has blossomed into a lovely friendship. As I think of it, she is the only person I see regularly that I am not related to nor that I work with. Amy was the first person to encourage me to write about my weight loss experience and transition into healthier living. Scheduling friend time has been life giving to me. I can no longer eat an entire breakfast so Amy and I shared the omelet. It is filled with pepper jack cheese. The bread is lightly buttered toasted wheat focaccia. Still, I threw out several pieces of bread and part of the eggs. But, to me, that is ok because I got the taste and experience I wanted. Breakfast was good but “coffee talk” was great! Your “coffee talk” reminds me of a little short story called “The mayonnaise jar and the coffee”, you should google it, if you have not read it before, it is very uplifting! A good talk with a close friend over coffee is often the best cure for getting out daily frustrations and much needed venting, as well as happy stories and catching up, of course. Have a lovely day! Your blog is wonderful! Thank you for reading mine and commenting. That’s what makes the world go round! Have a yummy day! Rachel – I just looked up the mayonnaise jar and 2 cups of coffee. I HAVE read it…and best of all? I remember my mother sending it to me. Thank you again for the lovely reminder of how my time spent with a friend is never wasted. Continued good luck with your writing.